Research Highlights in Technology and Teacher Education 2016 . Published 2016 . ISBN 978-1-9397-9726-1 Publisher: Society for Information Technology & Teacher Education. 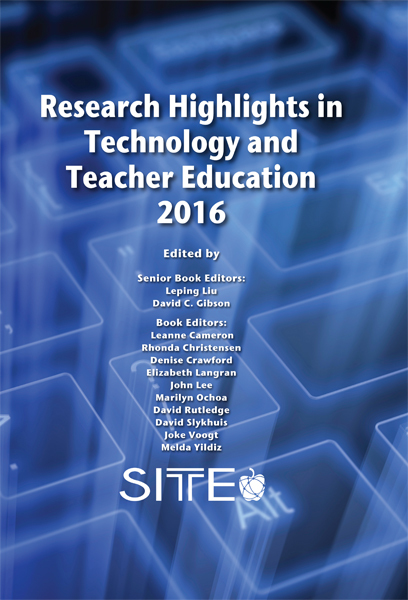 SITE is proud to present the 2016 Research Highlights in Technology and Teacher Education. This compilation represents some of the finest research presented at the 2016 SITE conference in Savannah, GA. Each article underwent two rounds of rigorous peer-review and the scholars featured in this book should be proud of their accomplishments. The authorship of this book, with authors coming from many different countries around the world, illustrates how SITE is truly an international organization. SITE is also a broad-based organization of scholars from a wide variety of disciplines who are all interested in the role of technology in teacher education and the variety of topics, from TPACK to technology integration to assessment, in this book speaks to this fact. Liu, L. & Gibson, D. (2016). Research Highlights in Technology and Teacher Education 2016 . Society for Information Technology & Teacher Education. Retrieved April 24, 2019 from https://www.learntechlib.org/primary/p/174168/.